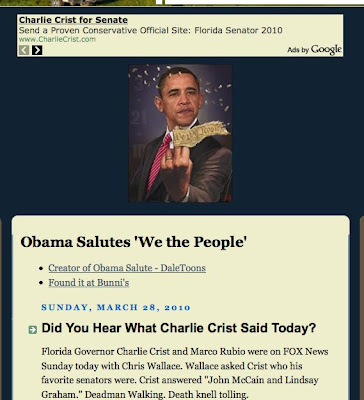 Florida Governor Charlie Crist and Marco Rubio were on FOX News Sunday today with Chris Wallace. Wallace asked Crist who his favorite senators were. Crist answered "John McCain and Lindsay Graham." Deadman Walking. Death knell tolling. Like this little blog, Maggie has ads from Google on her blog. It's good, since it's a way for Maggie to make money off of people who feel differently about topics than she does, essentially allowing the opposition to fund you. Capitalists feel this way. It's a waste of space since it prevents a potentially more audience-centric ad from displaying. Capitalists feel this way, too. I'm certainly not being critical of, or even poking fun at, Maggie. This is simply the instance that happened while I felt like blogging about it. And, it'll happen here. I have configured the ads here to refrain from showing certain ads (I fall into camp 2, above). But there's no way to catch them all. Which is fine (I also fall into camp 1, above). It's good to be capitalist. Yeah Basil, I've often chuckled while reading a post about how horrid Michelle Obama is, while seeing an ad next to it to buy a "Michelle Obama Doll." The one I really loved was when I was on Wendy's "Right Girl" site, and she was writing in her standard demure way about "Stoning some muslim "b**ch!" The ad below was for a "Muslim dating" site. Nyuk! It's a crap-shoot with ads. Of course, a guy that only gets 12 hits a day like me has ZERO trouble figuring out what to do. No ads...just my foolishness.